Each internet stock has plenty going in its favor, so which one offers investors more long-term upside? To quote the venerable comedy Old School, "True love is blind." Whether or not that's the case in romance, that kind of thinking can lead to disastrous results in investing. 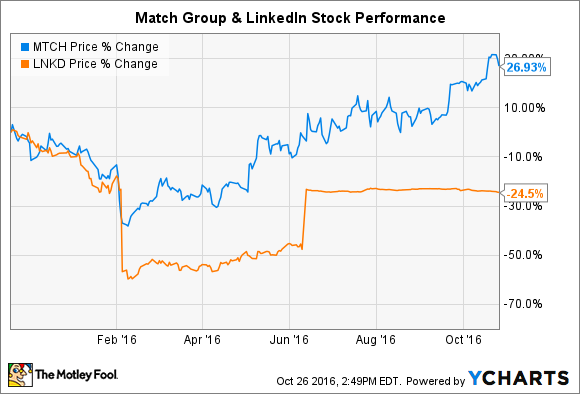 In this showdown of internet businesses, shares of Match Group (NASDAQ:MTCH) and LinkedIn (NYSE:LNKD.DL) have traveled markedly divergent paths over the past year. At the same time, these two companies also enjoy very different outlooks and business models, so let's put them each under the microscope to see which makes the most sense as a better stock to buy today. Just to get this out of the way, Microsoft's (NASDAQ:MSFT) mammoth $26.2 billion acquisition of LinkedIn is expected to close by the end of the year. This might make an investment review for LinkedIn seem pointless, but understanding LinkedIn's strengths and weaknesses is just as important for Microsoft shareholders as it is for those holding its stock before the closing date, given the massive dollar values being deployed here. Thankfully for Microsoft, LinkedIn enjoys all the makings of an enduring business franchise. The service is by far the largest professional social-media company in the world, with 450 million members as of its most recent quarterly report. What's more, LinkedIn's three-pronged business model provides the company with revenue generation opportunities on both the employee and employer side of its service. As of its most recent quarter, all three of its segments -- talent solutions, marketing solutions, and premium subscriptions -- continued to grow sales faster than 20% year over year. Equally impressive, LinkedIn has made significant strides to enhance its mobile experience, an area that had long been viewed as a key strategic weak point in today's mobile environment. In terms of the overall health of its business, Microsoft shareholders are buying what should become a consistently profitable business; I've discussed in the past why the deal makes sense purely from a financial perspective. It's also worth noting that LinkedIn's pre-merger investment case is at least somewhat interesting. With the deal set to wrap up by the end of 2016 and both boards already unanimously in favor of the deal, it seems far more likely than not that the deal will close. However, LinkedIn's stock remains around $7 lower than the $196-per-share acquisition price (a topic I plan to cover in greater detail later this week). Both in terms of today and tomorrow, I'm bullish on LinkedIn as a company. It's easy to scoff at the idea of investing in dating apps, but investors should strongly consider swiping right (that's slang for "liking") on shares of online dating leader Match Group. The recent IPO spinout from online media giant IAC/InteractiveCorp has been on fire in recent months, and for good reason. Match Group controls a bevy of leading dating apps, including Match.com, OKCupid, Meetic, Delightful, HowAboutWe, Chemistry.com, OurTime, BlackPeopleMeet, PlentyOfFish, and Tinder. Since most dating apps begin as free services and eventually incorporate different monetization strategies, Match Group remains early on in its revenue-generation life cycle. Despite its evolving business model, the results have been impressive to say the least. However, what intrigues me most about Match Group isn't its gangbusters sales growth, but rather its profitability. Thanks to their light capital requirements, Match Group's suite of dating apps are surprisingly cheap to run. The company expects its adjusted EBITDA to come in between $400 million and $415 million, though its historical financials suggest some room for improvement there. Contrast this with even LinkedIn -- a high-growth company still struggling to become consistently profitable -- and the winning economics of Match's business model truly stand out. In terms of valuation, Match Group expects to produce about $200 million in free cash flow, giving it a very reasonable price-to-free cash flow ratio of 23. Especially since it remains in the early days of Match's efforts to monetize its user base, there's room to believe better days lie ahead. Though I like both businesses, Match Group wins here for a number of reasons. First, as mentioned, the company's lucrative margin profile makes it a strong bet to continue to power ever-greater profits to its shareholders. Additionally, though I love LinkedIn's business model, its upside as an investment remains capped, and its place in Microsoft's sprawling reporting structure is likely to further obscure this incredibly valuable franchise. This decision might have come out differently had the LinkedIn-Microsoft acquisition not been announced, but given the realities and its compelling economics, Match Group strikes me as the better buy today.